[Matt’s] finishing up his computer science degree. 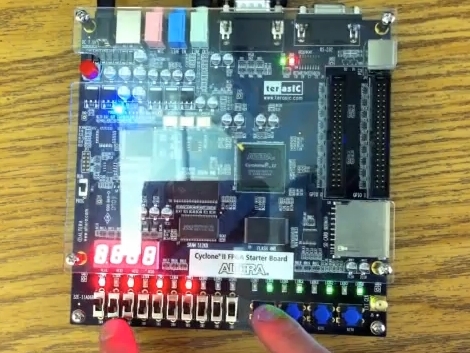 As part of a class assignment he programmed his own sequencer which runs on a Cyclone-II FPGA development board. We’ve embedded a video below the fold that shows you what it can do. The buttons and LEDs offered on the board actually allowed him to create a nice user interface. Each slide switch has a surface mount LED above it, giving feedback for which beats in the loop are on and off. There’s also a bank of momentary-push buttons seen in blue above. [Matt] uses these to tweak settings like the pitch that is stored for each slide switch. He even puts on a light show with the VGA output. We’ve seen this Altera board before, used to drive a falling sands game. The hardware will run you around $200 but that’s not bad considering all of the fun things you can do with it.